On September 30th 2016, while exploring Jungle Gardens, I found two unusual small trees growing along the edge of the forest on the hill above Buddha. The leaf shape, venation and bright green color caught my attention from some distance away. Initially I thought it could be one of several native Louisiana trees. I made a small collection of the foliage and tried to match it to similar specimens at the UL Herbarium. It did not match any of the native plants I thought it could have been. This was a tree I had never encountered before. The next day I returned and photographed living material and sent the photos to Eugene Woffard at the Univ. of TN Knoxville. He thought it could be a species of introduced buckthorn, Rhamnus and suggested I contact Anthony Reznicek. “Tony” from the Univ. 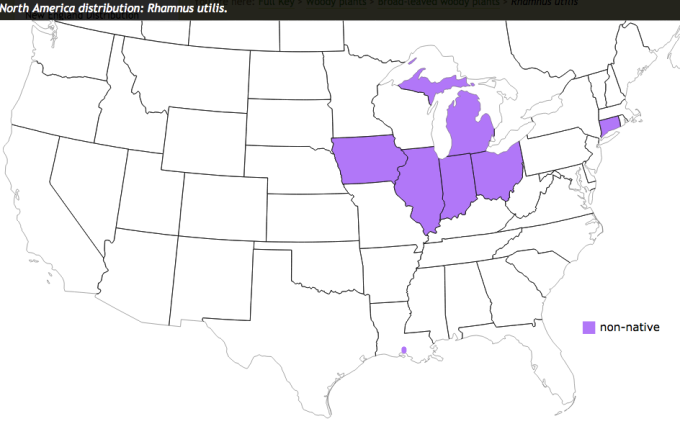 of Michigan, Ann Arbor is regarded as US expert on the Rhamnaceae. I emailed photos to him and he agreed it looked as though it could be one of several introduced Buckthorn species. He would need reproductive material to make a final determination. The following spring on March 29th 2017 one of the two trees was in flower. All along the young branches in leaf axils were dense clusters of small yellow-green flowers. I took photographs and made several herbarium specimens. A specimen was sent Reznicek in Ann Arbor. Upon receipt he confirmed that the mystery plant was the Chinese Buckthorn, Rhamnus utilis. Chinese buckthorn is a spiny shrub or small tree, typically growing to 4 m (12 feet) tall. It is native to China, Japan, and Korea. It has been introduced to the US and its known distribution includes, IA, IL, IN, MI and CT. It is not known to occur in any state south of that group of central states. Its presence in Louisiana represents a significant disjunct distribution for the species. It seems unlikely that the Jungle Gardens, Avery Island location for Rhamnus utilis is due to long distance dispersal, considering the absence of the tree in all other states between Iowa and Louisiana. Due to the extensive introduction of Asiatic species in Jungle Gardens, I am inclined to believe that these two trees represent plants persisting or spreading after cultivation from introductions planted long ago. I have carefully monitored both trees during two flowering seasons, spring 2017 and 2018. The trees produce flowers in great abundance but all have failed to yield even a single fruit. The complete absence of fruits with seeds would certainly account for the rarity of this species in Jungle Gardens. It is said to be an “insidious species” where it has become established in other regions of the US so its inability to reproduced well in south Louisiana may be a blessing.